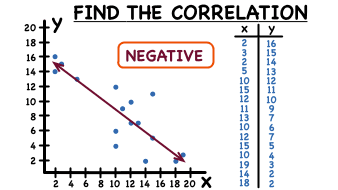 How Do You Use a Scatter Plot to Find a Negative Correlation? Got a bunch of data? Trying to figure out if there is a positive, negative, or no correlation? Draw a scatter plot! This tutorial takes you through the steps of creating a scatter plot, drawing a line-of-fit, and determining the correlation, if any. Take a look! Looking at a line-of-fit on a scatter plot? Does that line have a positive slope? If so, your data shows a positive correlation! Learn about positive correlation by watching this tutorial. How Do You Use a Scatter Plot to Find a Line of Fit? A line-of-fit is a line that summarizes the trend in a set of data. In this tutorial, you'll see how to graph data on a coordinate plane and draw a line-of-fit for that data. Check it out!